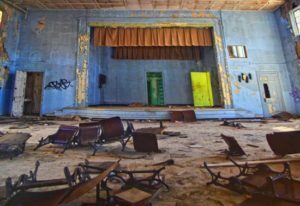 It may seem unusual for a travel writer to be interested in the abandoned, derelict and forgotten. I am usually telling my readers where to travel and what to visit when they get there. 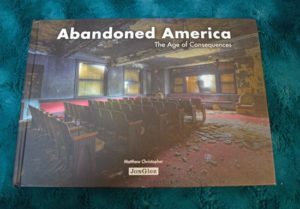 But Abandoned America: The Age of Consequences is such a fascinating book about deserted buildings of every description; I want to tell you about it. Many times I find myself wondering what was when I drive by an abandoned house or business. 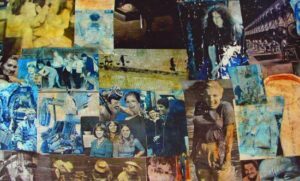 The genius of Christopher’s narrative and photography drew me into the story about not only an empty building, but the fact it often appears as if one day everyone simply disappeared. Churches, social clubs, factories, schools and prisons all reflect the decay and yet the humanness of the people who once occupied its space. 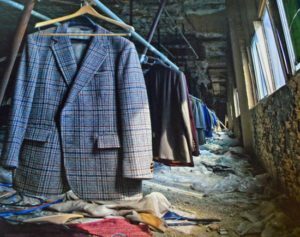 The photos of the Lebow Brothers Clothing Company building in Baltimore, for example, encapsulate the remains of where 350 people once worked. 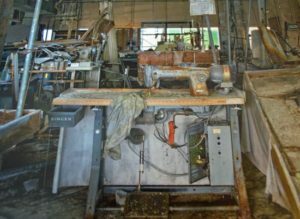 Today on this site is the Baltimore Design School, but when Christopher took the photos in 2008 it was filled with men’s suits and overcoats, sewing machines and office furniture along with debris of a crumbing building. Royal blue curtains hand above the auditorium stage of Thomas A. Edison High School (also known as Northeast High School and Julia de Burgos Magnet Middle School) in Philadelphia. Pictures still hang on a bulletin board, and chairs and desks are tossed about classrooms. In 2013 the building was torn down. This beautifully presented book offers not only the history of the buildings, but Christopher shows his readers what happens when a building is abandoned and memorializes its last breath of life. Abandoned America: The Age of Consequences is available at Amazon.com and BarnsandNoble.com. Thank you!! I appreciate your kind comment! I hope you will continue to check out my website! Thank YOU!! I appreciate you checking out my website!